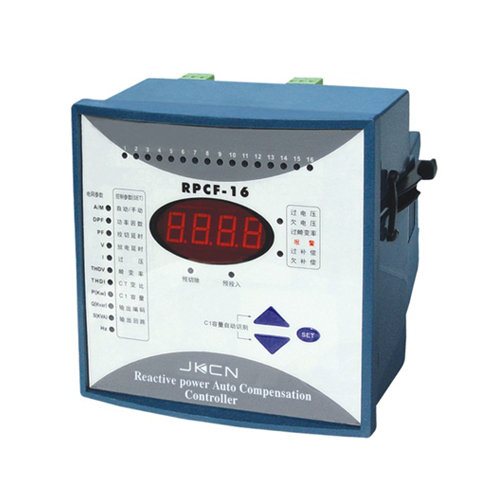 RPCF3 series automatic phase discriminated reactive power compensating controller has all the advantages of RPCF series meanwhile this controller sample the signals of voltage and curren from three phases respectively, it will avoid the var meter recording quickly or inversely rotating even if the power factor has been compensated fully in three phase unbalanced system. 1. On basis of fundamental wave reactive power, calculate the reactive power to be switched on it can avoid switching shock of any forms, it can accurately display the power factor of system with harmonic wave. 2. High measurement accuracy, wide display scope. 3. Real time display general power factor and fundamental wave PF. 4. Real time display the distortion rates of voltage and current. 5. Total 12 kinds of coding output can be chosen. 6. 16 circuits of output at maximum. 7. Human friendly interface, convenient operation. 8. Various control setting can be adjusted digitally, directly and easily. 9. Automatic and manual operations, two modes provided. 10. Over voltage and absent voltage protection provided. 11.Protection against superscale of harmonic wave voltage. 12. Data not lost even if power shut down. 13. Current signal input resistance <0.01Ω. 14. Communication function ((MODBUS-RTU RS485) provide. 15. Compensating power factor able to be adjusted: 0.70 lag~0.7 forward.